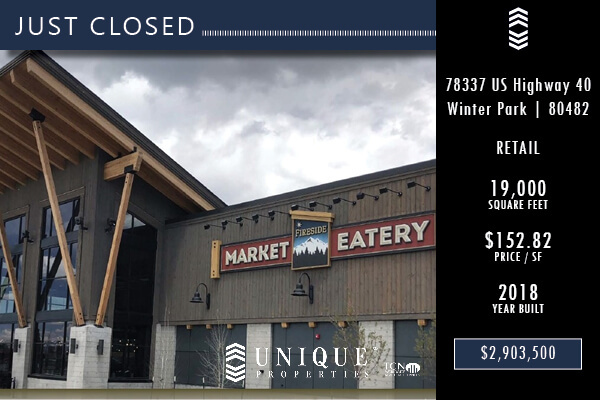 Phillip A. Yeddis, Executive Vice President of Unique Properties, Inc., Colorado’s most experienced, privately held, full-service commercial real estate brokerage firm, is proud to announce the sale of 78337 US Highway 40, Winter Park, CO 80482 for $2,903,500. The single tenant property has a long-term tenant, Fireside Market Eatery. The 19,000 SF freestanding building was completed in 2018 and has a shared parking structure owned by the Town of Winter Park. The property is located right on Main Street in Winter Park with extensive residential development and retail in the surrounding area providing excellent visibility and walkability. The property won the Governor’s Award for best new addition to Downtown Winter Park. Yeddis represented the buyer, WP Properties, LLC. The seller, Winter Park Development Co, LLC. was represented by DePaul Real Estate Advisors.